Hello, and welcome to the third article in my series about my Backyard Aquaponics Build. The idea is to raise 25 or so rainbow trout to right around 1Kg / 2lbs each to put into our freezer for suppers over the winter. If all goes well, the system will recover its set-up costs over three summers, and will yield all the ingredients for sizeable batch of a good tomato-based pasta sauce each year as a bonus. In the last article, I talked about the “Grow-pipes” I am using instead of standard deep-media beds. In this article, I’m going to touch on what I’m doing with air and power for the system. I hope you find something useful! Disolved oxygen, known as “DO”, is crucial to the operation of an aquaponics system. Firstly, it’s what keeps the fish from suffocating. Their gills extract the DO from the water to allow them to breath, and they “exhale” a mixture of carbon dioxide (CO2) and ammonia (NH3). The beneficial bacteria that convert ammonia to nitrites and then nitrates, known as nitrobacter, come in two general strains. One of them, the kind you’d rather have in a fish tank, needs oxygen-rich water. The other kind lives in swamps and sewer tanks, and you don’t want your aquaponics system smelling or looking like that. In general, the water surface can transfer enough oxygen into the water and carbon dioxide out of the water to support a half-kilogram of fish per 40L / 10USG of water. So, in my 1000L system, at most I can keep is 15 full-sized rainbow trout. I’m keeping closer to twice that number so, obviously, natural process is not going to be enough. The bell-siphon process that drains each of the grow-pipes does a good job of “passively” adding DO to the water, but it really only affects the top 30cm / 1ft or so of the water column. The IBC tank is 1.25m / 4ft deep, so that’s obviously not going to do the job alone. I do not want the bottom of the tank, where the solid fish waste, un-eaten food, etc, falls, to become low in DO and start running like a septic tank. 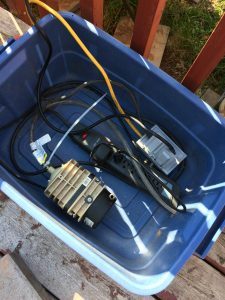 Weather Box for Power and Air using a simple plastic storage bin. The obvious answer is to pump air under pressure to the bottom of the tank and let it bubble up through the water. I’m using the same 75LPM air pump as I had in the prior greenhouse build. The pump is in a DYI weather box that has holes in it for air, hoses and wires to come and go without letting rain and the like in. The air pump goes to an 8-valve manifold that allows me to split the air up into a variety of destinations. You can get a lot of work done with 75LPM at 3psi, so being able to route it as I need it to multiple destinations is very handy. Currently, I’m only using two air lines off the manifold, but that may increase to four once I see how my water chemistry hold on and how the fish are as they get bigger. Bigger fish eat more, make more solid waste, take up more DO and put out more CO2 and NH3. That will probably require more DO to be put into the water to compensate for. We’ll see.